Tuberculosis (TB) is an infectious disease that spreads through bacterial inhalation, and primarily targets the lungs. Most infections are latent, meaning that patients develop no discernible symptoms. In fact, the World Health Organization (WHO) estimates that roughly a quarter of the world’s entire population is infected with TB. These cases can become active, with a high fatality rate for individuals suffering from untreated TB symptoms, which include: persistent phlegmy or bloody coughing; fever; appetite reduction; and glandular swelling. The condition is listed as one of the top ten causes of death worldwide, and is believed to have caused more fatalities in the last 200 years than any other infectious disease. TB research is central to worldwide Sustainable Development Goals, with over 95% of TB deaths occurring in low- and middle-income environments. Established laboratory instruments are used to perform diagnoses and support treatments. Yet, while an estimated 53 million people were saved between 2000—2016 due to existing TB treatment methods, improved techniques are required to characterize TB exposure under realistic conditions. Inhalation exposure systems are self-contained laboratory instruments for experiments involving animal-exposure to nebulized pathogens. These units enable researchers to produce airborne droplets of infectious agents such as MTB, and simulate distinct atmospheric conditions to monitor the rate of infection against tightly-controlled parameters, such as: pathogenic concentration; air flow rate; length of exposure. This unit is comprised of several distinct laboratory instruments that work in conjunction to provide the most precise research results possible. The primary component is the inhalation exposure chamber, which can be formulated as a desktop unit or a full-size aluminum cabinet. Mesh animal containment baskets are loaded into the chamber on top of a supporting baffle plate. The antigenic sample is introduced to the chamber via a homogenizing component, which atomizes the sample using pressurized air. 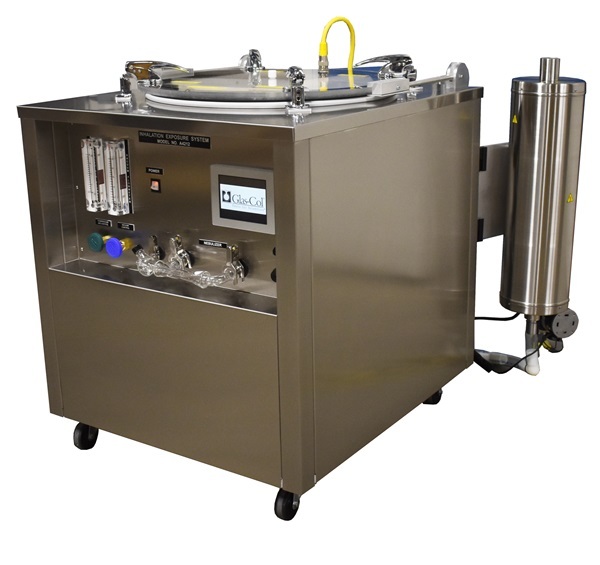 This is the most critical laboratory instrument in the array, drawing air from the room beyond the decontamination system to provide a suitable mixture for delivery. These systems can accurately produce deep-lung infections that reflect real-world conditions, providing insights into the characteristics of airborne pathogens under varying parameters. Inhalation exposure systems also come equipped with outstanding laboratory instruments for decontamination procedures and to reduce incidental pathogen exposure. UV lamps equipped to the cabinet produce ultraviolent light of 254 nm, with an attached incinerator to purify the interior chamber before and after experimentation. This equipment is increasingly important for research into the characteristics of airborne pathogens, with applications for TB research and development. Glas-Col supplies a range of innovative solutions for laboratory applications, including pharmaceutical and diagnostics research in areas with a significant moral and humanitarian impact. Research into airborne bacteria such as MTB could fundamentally inform future health and sanitation practices, as the WHO seeks to end the TB epidemic by 2030. If you would like any more information about performing TB research with our laboratory instruments, please do not hesitate to contact us.